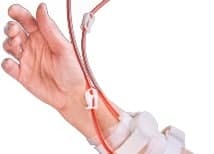 If bleeding after venipuncture is a concern, Vas-Clamp® Vascular Access Site Clamp will apply gentle pressure to the needle site eliminating the need for manual/digital pressure. Vas-Clamp® adjusts to individual patient requirements and frees staff for other tasks while needle site is gently compressed until homeostasis occurs. Vas-Clamps® can be sterilized and reused many times. Vas-Clamp® is a durable, strong and adaptable needle site clamp which achieves faster hemostasis while saving staff and chair time. Vas-Clamp® relieves staff and patients of time-consuming and uncomfortable application of digital pressure. Vas-Clamp® minimizes damage to grafts and fistulas while attaining hemostasis and the bright white visibility helps you to avoid the possibility of excessive or prolonged compression. Gentle, non-crushing compression is diffused over an area larger than the needle site. Vas-Clamp® has easily positioned Velcro straps and smooth polypropylene cylinders which are completely sterilizable for maximum infection control. To order your Vas-Clamp, click on the Shop tab or call 651.385.2175 x3087. If you are using a purchase order email sales@acrotechis.com.